The fashion of Maria Edgeworth's world has long passed away, but human nature is still here, and the fiction which was so true to it in the first years of the century is true to it in the last. "The Absentee," "Vivian," "Ennui," "Helen," "Patronage," show their kindred with "Belinda," and by their frank and fresh treatment of character, their knowledge of society, and their employment of the major rather than the minor means of moving and amending the reader, they all declare themselves of the same lineage. In their primitive ethicism they own Pamela, and Sir Charles Grandison for their ancestors; but they are much more dramatic than Richardson's novels; they are almost theatrical in their haste for a direct moral effect. In this they are like the Burney-D'Arblay nov­els, which also deal with fashionable life, with dissi­pated lords and ladies, with gay parties at Vauxhall and Ranelagli, with debts and duns, with balls and routs in splendid houses, whose doors are haunted by sheriff's officers, with bankruptcies and arrests, or flights and suicides. But the drama of the Edge-worth fiction tends mostly to tragedy, and that of the Burney-D'Arblay fiction to comedy; though there are cases in the first where the wrong-doer is saved alive, and cases in the last where he is lost in his sins. The au­thor of Evelina was a good but light spirit, the author of Belinda was a good but very serious soul and was amusing with many misgivings. Maria Edgeworth was a humorist in spite of herself; Frances Burney was often not as funny as she meant, and was, as it were, forced into tragical effects by the pressure of circum­stances. You feel that she would much rather have got on without them; just as you feel that Miss Edge-worth rejoices in them, and is not sure that her jokes will be equally blessed to you. It remained for the greatest of the gifted women, who beyond any or all other novelists have fixed the charac­ter and behavior of Anglo-Saxon fiction, to assemble in her delightful talent all that was best in that of her sis­ters. Jane Austen was indeed so fine an artist, that we are still only beginning to realize how fine she was; to perceive, after a hundred years, that in the form of the imagined fact, in the expression of personality, in the conduct of the narrative, and the subordination of incident to character, she is still unapproached in the English branch of Anglo-Saxon fiction. In American fiction Hawthorne is to be named with her for perfection of form; the best American novels are built upon more symmetrical lines than the best English novels, and have unconsciously shaped themselves upon the ideal which she instinctively and instantly realized. Of course it was not merely in externals that Jane Austen so promptly achieved her supremacy. The wonder of any beautiful thing is that it is beautiful in so many ways; and her fiction is as admirable for its lovely humor, its delicate satire, its good sense, its kind­ness, its truth to nature, as for its form. There is noth­ing hurried or huddled in it, nothing confused or obscure, nothing excessive or inordinate. The marvel of it is none the less because it is evident that she wrote from familiar acquaintance with the fiction that had gone before her. In her letters there are hints of her intimacy with the novels of Goldsmith, of Richardson, of Frances Burney, and of Maria Edgeworth; but in her stories there are scarcely more traces of their influence than of Mrs. Radcliffe's, or any of the romantic writers whom she delighted to mock. She is obviously of her genera­tion, but in all literature she is one of the most original and independent spirits. Her deeply domesticated life was passed in the country scenes, the county society, which her books portray, far from literary men and events; and writing as she used, amidst the cheerful chatter of her home, she produced literature of still un­rivalled excellence in its way, apparently without lit­erary ambition, and merely for the pleasure of getting the life she knew before her outward vision. With the instinct and love of doing it, and not with the sense of doing anything uncommon, she achieved that master­piece, Pride and Prejudice, which is quite as remark­able for being one of several masterpieces as for its ab­solute excellence. There have been authors enough who have written one extraordinary book; but all Jane Austen's books are extraordinary, and Persuasion, Northanger Abbey, Emma, Mansfield Park, and Sense and Sensibility, are each a masterpiece, inferior only to Pride and Prejudice, which was written first. After the young girl of twenty had writ­ten it, she kept it half as many years longer before she printed it. In mere order of chronology it belongs to the eighteenth century, but in spirit it is distinctly of the nineteenth century, as we feel that cycle to have been when we feel proudest of it. In manners as much as in methods it is such a vast advance upon the work of her sister novelists that you wonder whether some change had not already taken place in English society which she notes, and which they fail to note. The topics of the best fiction of any time will probably be those which decent men and women talk of together in the best company; and such topics vary greatly from time to time. There is no reason to think that Frances Burney and Maria Edgeworth were less pure-minded than Jane Austen, but they dealt with phases of human experience which she did not deal with, be­cause their friends and acquaintances did so, without being essentially worse than hers. A tendency towards a more scrupulous tone seems to have been the effect of the general revival in religion at the close of the last century, which persisted down to that time in our own century when the rise of scientific agnosticism loosed the bonds of expression. Now again of late years men and women in the best company talk together of things which would not have been discussed during the second and third quarters of the century. One must hedge one's position on such a point with many perhapses ; nothing can be affirmed with certainty; the most that can be said is that the tone if not the temper, the man­ners if not the morals, which have lately been called fin de Steele, are noticeably more akin to what was fin de siecle a hundred years ago, than they are to what was thought fit in polite society fifty years ago. Pos­sibly another revival of religion will bring another change, such as the purity of Jane Austen's fiction may have forecast rather than reported. But we do not know this, and possibly again her books are what they are in matter and manner because the little world of county society which she observed was wholesomer and de-center than the great world of London society which Miss Burney and Miss Edgeworth studied. An author is as great for what he leaves out as for what he puts in; and Jane Austen shows her mastery in nothing more than in her avoidance of moving ac­cidents for her most moving effects. She seems to have known intuitively that character resides in habit, and that for the novelist to seek its expression in violent events would be as stupid as for the painter to expect an alarm of fire or burglary to startle his sitter into a valu­able revelation of his qualities. She puts from her, therefore, all the tremendous contrivances of her prede­cessors, and takes her place quietly on the ground to which they were, the best of them, falteringly and un­certainly feeling their way. After De Foe and Gold­smith she was the first to write a thoroughly artistic novel in English, and she surpassed Goldsmith as far in method as she refined upon De Foe in material. Among her contemporaries she was as easily first as Shakspere among the Elizabethan dramatists; and in the high excellencies of symmetrical form, force of charac­terization, clearness of conception, simplicity and tem­perance of means, she is still supreme: that girl who began at twenty with such a masterpiece as Pride and Prejudice, and ended with such a masterpiece as Persuasion at forty-two! The story of Pride and Prejudice has of late years become known to a constantly, almost rapidly, increas­ing cult, as it must be called, for the readers of Jane Austen are hardly ever less than her adorers: she is a passion and a creed, if not quite a religion. A beauti­ful, clever, and cultivated girl is already piqued and in­terested if not in love with a handsome, high-principled, excessively proud man, when she becomes bitterly prejudiced against him by the slanders of a worthless beneficiary of his family. The girl is Elizabeth Bennet, the young man is Fitzwilliam Darcy, and they first meet at a ball, where he behaves with ungracious in­difference to her, and afterwards at the dinners and parties of a small country neighborhood where persons theoretically beyond the pale of gentility are admitted at least on sufferance; the stately manners of the day are relaxed by youth and high spirits; and no doubt the academic elevation of the language lapses oftener on the lips of the pretty girls and the lively young men than an author still in her nonage, and zealous for the dignity of her style, will allow to appear in the conver­sation of her hero and heroine. From the beginning it seems to Darcy that Elizabeth shines in talk beyond all the other women, though some­times she shines to his cost. But banter from a pretty girl goes farther than flattery with a generous man; and from the first Darcy is attracted by Elizabeth Ben-net's wit, as much as he is repelled by her family. In fact, he cannot get on with her family, for though the Bennets have a sufficiently good standing, in virtue of the father's quality as a gentleman, it is in spite the mother's folly and vulgarity, and the folly and vulgar­ity of all her sisters but one. Mrs. Bennet is probably the most entire and perfect simpleton ever drawn in fiction, and her husband renders life with her support­able by amusing himself with her absurdities. He buries himself in his books and leaves her the manage­ment of his daughters in society, getting what comfort he can out of the humor and intellectual sympathy of Elizabeth and the charming goodness of her elder sister Jane. The rest of his family are almost as impossible to him as they are to Darcy, to whom Mr. Bennet him­self is rather impossible, and who resolves not only to crush out his own passion for Elizabeth, but to break off his friend Bingley's love for her sister Jane. His success in doing the one is not so great but he duly comes to offer himself to Elizabeth, and he owns in the humiliation of rejection that he believes he has failed in the other. From this point the affair, already so daringly imag­ined, is one of the most daring in fiction; and less cour­age, less art, less truth than the author brings to its management would not have availed. It is a great stroke of originality to have Darcy write the letter he does after his rejection, not only confessing, but defending his course; and it is from the subtle but perfectly honest sense of character in her heroine that the author has Elizabeth do justice to him in what she so bitterly re­sents. When she has once acknowledged the reason of much that he says of her family (and she has to ac­knowledge that even about her adored father he is meas­urably right), it is a question merely of friendly chances as to the event. These are overwhelmingly supplied, to Elizabeth's confusion, by Darcy's behavior in help­ing save her sister Lydia from the shame and ruin of her elopement with the worthless Wickham. Lydia, who is only less entirely and delightfully a fool than Mrs. Bennet herself, is thus the means of Elizabeth's coming to such a good mind in regard to Darcy that her only misgiving is lest it may be too late. But Darcy has been enlightened as well as she: he does everything a man can to repair his wrongs and blunders, and with a very little leading from Elizabeth, he is brought to offer himself again, and is accepted with what may be called demure transport, and certainly with alacrity. The aunt whom Darcy means is Lady Catharine de Burgh, as great a fool as Mrs. Bennet or Lydia, and much more offensive. She has all Darcy's arrogance, without a ray of the good sense and good heart which enlighten and control it, and when she hears a rumor of his engagement to Elizabeth, she comes to question the girl. Their encounter is perhaps the supreme mo­ment of objective drama in the book, and is a bit of very amusing comedy, which is the more interesting to the modern spectator because it expresses the beginning of that revolt against aristocratic pretension character­istic of the best English fiction of our century. 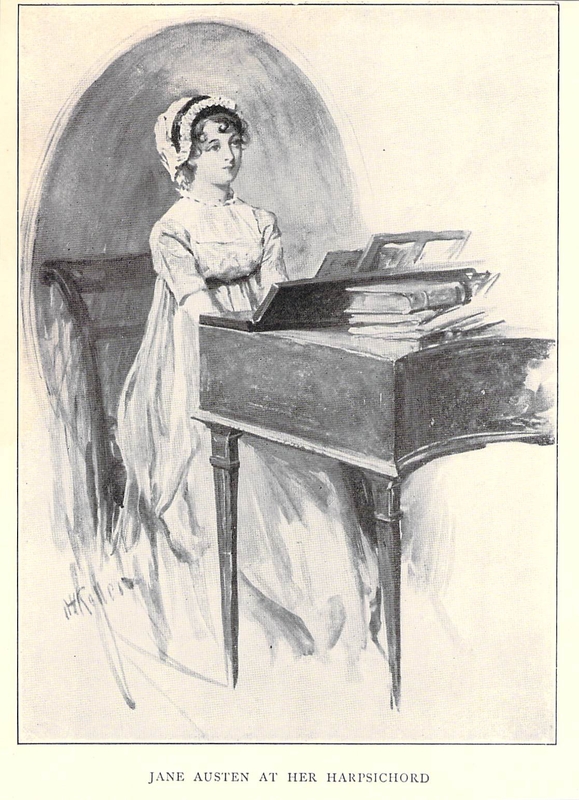 Its spirit seems to have worked in the clear intelligence of the young girl to more than one effect of laughing satire, and one feels that Elizabeth Bennet is speaking Jane Austen's mind, and perhaps avenging her for patronage and impertinence otherwise suffered in si­lence, when she gives Lady de Burgh her famous setting-down. "Lady Catharine very resolutely, and not very po­litely, declined eating anything, and then, rising up, said to Elizabeth: 'Miss Bennet, there seems to be a prettyish kind of a little wilderness on one side of your lawn. I should be glad to take a turn in it, if you will favor me with your company.' . . . Elizabeth obeyed, and running into her own room for her para­sol, attended her noble guest down-stairs. ... As soon as they reached the copse, Lady Catharine began in the following manner: ' You cannot be at a loss, Miss Bennet, to understand the reason of my visit hither. Your own heart, your own conscience, must tell you why I came.' Elizabeth looked with unaffected aston­ishment. 'Indeed, you are mistaken, madam; I have not been at all able to account for the honor of seeing you here.' 'Miss Bennet,' replied her ladyship in an angry tone, 'you ought to know that I am not to be trifled with. But however insincere you may choose to be, you shall not find me so. ... A report of a most alarming nature reached me two days ago. I was told . . . that you, Miss Elizabeth Bennet, would, in all likelihood, be soon afterwards united to my nephew, to my own nephew, Mr. Darcy. Though I knew it must be a scandalous falsehood, though I would not injure him so much as to suppose the truth of it possible, I instantly resolved on setting off for this place, that I might make my sentiments known to you.' ' If you believed it impossible to be true,' said Elizabeth, coloring with astonishment and disdain, ' I wonder you took the trouble of coming so far. What could your ladyship propose by it ?' ' This is not to be borne. Miss Bennet, I insist upon being satisfied. Has he, has my nephew made you an offer of marriage?' 'Your lady­ship has declared it to be impossible.' 'It must be so while he retains the use of his reason. But your allure­ments may, in a moment of infatuation, have made him forget what he owes to himself and to all his family. You may have drawn him in.' 'If I have, I shall be the last person to confess it.' ' Miss Bennet, do you know who I am? I have not been accustomed to such lan­guage as this. . . . This match, to which you have the presumption to aspire, can never take place. . . . Because honor, decorum, precedence, nay, interest for­bid it. Yes, Miss Bennet, interest; for do not expect to be noticed by his family or friends. . . . Your alliance will be a disgrace; your name will never even be mentioned by any of us. . . . Let us sit down. You are to understand, Miss Bennet, that I came here with the determined resolution of carrying my purpose. . . . I have not been in the habit of brooking disap­pointment.' 'That will make your ladyship's situa­tion at present more pitiable; but it will have no effect on me.' 'I will not be interrupted! ... If you were sensible of your own good, you would not wish to quit the sphere in which you have been brought up.' 'In marrying your nephew, I should not consider myself as quitting that sphere. He is a gentleman; I am a gentleman's daughter; so far we are equal.' ' True, you are a gentleman's daughter. But what was your mother? Who are your uncles and aunts?' . . . 'Whatever my connections may be,' said Elizabeth, 'if your nephew does not object to them, they can be nothing to you.' 'Tell me, once for all, are you en­gaged to him?' Though Elizabeth would not for the mere purpose of obliging Lady Catharine, she could not but say, after a moment's deliberation,' I am not.' Lady Catharine seemed pleased. ' And will you promise me never to enter into such an engagement?' ' I will make no promise of the kind. . . . How far your nephew might approve of your interference in his affairs, I can­not tell; but you have certainly no right to concern yourself in mine. I must beg, therefore, to be impor­tuned no further on the subject. . . . You have insulted me in every possible method. I must beg to return to the house.' And she rose as she spoke. Lady Catharine rose also and they turned back. Her lady­ship was highly incensed. 'And this ... is your final resolve! Very well, I shall know how to act. Do not imagine, Miss Bennet, that your ambition will ever be gratified. I came to try you. I hoped to find you reasonable; but depend upon it, I shall carry my point.' In this manner Lady Catharine talked on till they were at the door of the carriage, when, turning hastily round, she added, 'I take no leave of you, Miss Bennet. I send no compliments to your mother. You deserve no such attention. I am most seriously displeased.' Elizabeth made no answer; and without attempting to persuade her ladyship to return into the house, walked quietly into it herself." In all this the heroine easily gets the better of her an­tagonist not only in the mere article of sauce, to which it must be owned her lively wit occasionally tends, but in the more valuable qualities of personal dignity. She is much more a lady than her ladyship, as the author means she shall be; but her superiority is not invented for the crisis; it springs from her temperament and character, cool, humorous, intelligent and just: a com­bination of attributes which renders Elizabeth Bennet one of the most admirable and attractive girls in the world of fiction. It is impossible, however, not to feel that her triumph over Lady de Burgh is something more than personal: it is a protest, it is an insurrection, though probably the discreet, the amiable author would have been the last to recognize or to acknowledge the fact. An indignant sense of the value of humanity as against the pretensions of rank, such as had not been felt in English fiction before, stirs throughout the story, and reveals itself in such crucial tests as dear " little Burney," for instance, would never have imagined. For when Miss Burney introduces city people, it is to let them dis­play their cockney vulgarity; but though Jane Austen shows the people whom the Bennets' gentility frays off into on the mother's side vulgar and ridiculous, they are not shown necessarily so because they are in trade or the law; and on the father's side it is apparent that their social inferiority is not incompatible with gentle natures, cultivated minds, and pleasing manners. Comments on "JANE AUSTEN'S ELIZABETH BENNET"